Easter in Abruzzo provides many ways of exploring its pivotal belief system, with a touch of drama that makes it quite unique across Italy. I felt compelled to visit Chieti’s La processione del Venerdì Santo (Good Friday procession) after my friend Sergio expressed how moved he had been a previous year. 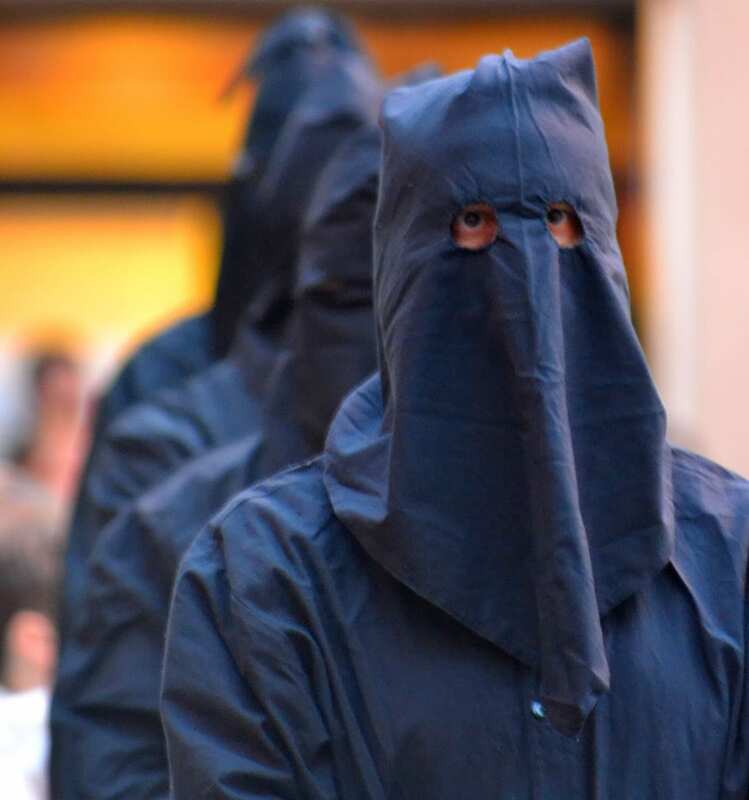 It must be something quite unique if both the BBC & Sky were making a documentary on what is Italy’s oldest Easter religious procession. Good Friday in my world normally means a day off without thinking too hard, so I was lapping up my first Easter in Abruzzo trying its wonderful cheese, lamb and spiced bread & biscuit dishes in a similar vein and not thinking too much about the real meaning of this springtime holiday. Exploring the story of Chieti’s evening torch-lit procession that weaves in & out of its historic centre soon put an end to that. 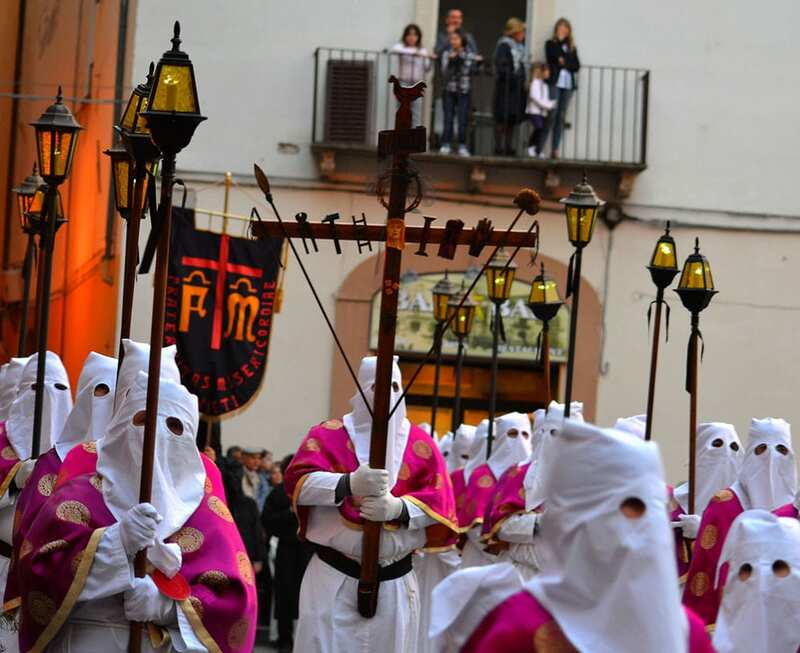 Created in 842 AD, this solemn Easter funeral procession in its most current form was remastered in the eighteenth century by the grand sounding ‘Arciconfraternita del Sacro Monte dei Morti’, who have organised the event each year, even in 1944 when the German army prohibited the event and it went ahead anyway against all odds. The procession is formed by members of the brotherhood, identifiable by the wearing of predominantly black which is framed by a gold satin cape to represent Mary’s mourning who lead the men and children from the 13 local church congregations. Each congregation wears different coloured robes and the men are hooded as a way of protecting their personal mourning, grief, penance and prayers. Capuchin originally stemmed from “hood” in Italian, hence the word for that popular frothy coffee! Each congregation walks to the rhythm of a troccola (the wooden instrument that traditionally replaces bells throughout Holy Week) interspersed by the antique brotherhood who carry different stations of the cross, this includes a cockerel, a severed hand, spears and lances, a statue of the mourning Mary robbed in black and pall bearers that carry a statue of a covered Christ. The procession starts from the Cathedral San Giustina after 19.00, do try and make your way here as this is the best photo opportunity! You know when the procession is about to make its way up the street you are standing on as a motorcade drives up and amazingly, since we are talking huge numbers here, the whole crowd becomes silent. The congregations are followed by Archbishop and local priests, who stop intermittently to recite a liturgy and prayers with prayers from crowd and congregations as they make their way back to the Cathedral. They are followed by my favourite part an orchestra that includes 100 violinists, many children who play the ‘Miserere’, a 10 stanza melancholic piece the work of a C18th local composer Selecchy, for the mostly 100 piece male choir that follows up the rear, singing a song that is incredibly moving. I am not sure about hairs on the back of my neck but it brought tears to my eyes! I loved the Conductor waving his glow stick baton. Apparently Verdi was inspired by this piece when he wrote his tragic opera ll Trovatore (The Troubadour). It is something very unique and surprisingly completely un-touristy and is worth attending even if like me you aren’t religious. Our advice is to get there early before 18.30 so that you get a reasonable parking spot which doesn’t require the whole ascent of Chieti, the historic centre like all Roman/Medieval towns being the centre at the very top. Do be local and do as every dressed up extended family member does and buy slices of pizza and focaccia to eat whilst you wait for the procession to come by. The procession takes a while to wind around the streets and restaurants here are booked long before the event so unless you book you won’t be popping into any restaurant after the end at approximately 21.30+ to eat!! Sounds fabulous. Knowing Chieti's historic center and the warmth of the locals it must be quite an experience. The reverence and dignity shown by Italians on these occasions never fails to impress me. I have missed this year but its going in the diary for next. Yes it\’s the wonderful people that make this region so special! I have just started to look for the 'perfect' small town to witness this holiday. 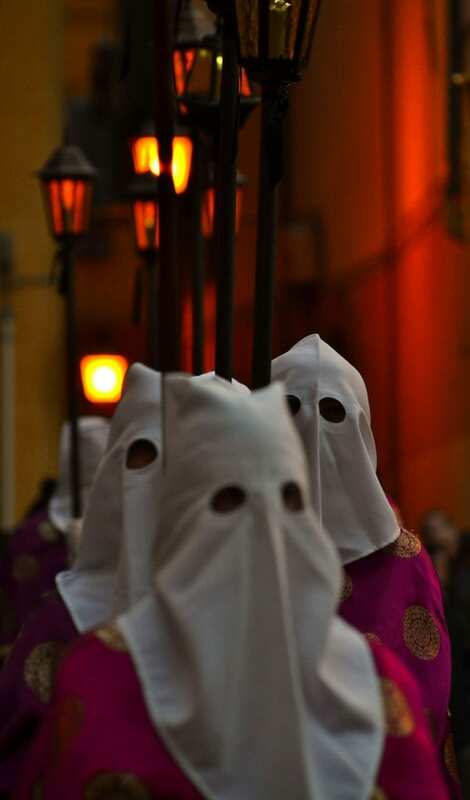 several years ago i was in sorrento and when out at 4 am with the ENTIRE town to do the black procession and followed the next night with the white procession. Ooh that sounds interesting, have you got any photos of it Ingrid? I've never managed to be in Abruzzo for Easter but I think I'll have to make the effort as there is so much going on. You captured some wonderful photographs of the event.